London: Arsenal condemned Cardiff to a 2-1 defeat on Tuesday as the Welsh side returned to action for the first time since a plane carrying the club’s record signing Emiliano Sala disappeared over the Channel Islands over a week ago. 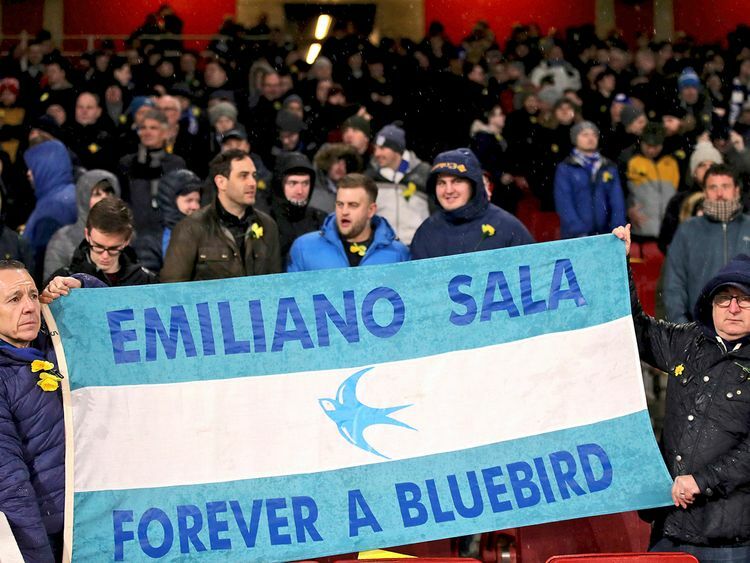 Sala never got the chance to play for Cardiff as the aircraft carrying the Argentine and pilot David Ibbotson lost contact when on its way to the Welsh capital on January 21 just two days after completing a move from Nantes. The captains of both sides also laid a bouquet of flowers on the pitch before kick-off, while Argentina shirts and flags were waved among the visiting support. Cardiff manager Neil Warnock described the past week as the toughest of his career and revealed both he and some of his players had sought the help of psychologists ahead of the game. However, in tragic circumstances, Cardiff performed admirably once the action got underway and could have given their chances of survival a huge boost had they taken advantage of a number of opportunities in the first half. Bobby Reid volleyed wide and then headed over with the two clearest chances early on. Arsenal boss Unai Emery surprisingly named Mesut Ozil as captain as the German was recalled among seven changes from the side that started Friday’s FA Cup defeat by Manchester United. Ozil was starting a Premier League game for the first time since Boxing Day, but failed to make an impact before being replaced 14 minutes from time as Arsenal struggled to get going in sodden conditions. The Gunners did have two strong penalty appeals turned down before the break, though, as Alexandre Lacazette appeared to be clipped by Bruno Ecuele Manga and then Sol Bamba. Cardiff had another big chance to go in front early in the second period when Shkodran Mustafi got across to block debutant Oumar Niasse’s shot. And Arsenal finally clicked into gear and got the penalty they wanted at the third time of asking when Manga tripped Sead Kolasinac as the Bosnian burst into the box. Pierre-Emerick Aubameyang coolly slotted away the penalty for his 15th Premier League goal of the season to move to within one of the division’s top scorer Mohamed Salah. Cardiff ‘keeper Neil Etheridge stood up well to block Alex Iwobi’s powerful drive from a narrow angle moments later. However, Lacazette’s angled shot did have too much power for the Filipino stopper seven minutes from time to seal a vital three points in Arsenal’s bid for a return to the Champions League next season. The Gunners remain in fifth on goal difference, but move level on points with Chelsea, who are in action at Bournemouth on Wednesday. Cardiff on the other hand remain rooted in the bottom three, but did at least grab a consolation their efforts on the night deserved when substitute Nathaniel Mendez-Laing curled home in stoppage time.